Earlier this month, we joined forces with other animal protection organisations and launched a petition calling on the UK government to ban cages for all farmed animals. Over 65,000 compassionate people have now signed the petition, but the government’s response has been shockingly inadequate. Their claim that they have ‘already banned cages where there is clear scientific evidence that they are detrimental to animal health and welfare’ is simply not true. There is overwhelming science proving that caging animals causes severe suffering. It is precisely because of this vast body of evidence that has led countries such as Sweden, Norway and Switzerland to ban cages for pigs and Austria and Germany to commit to banning all forms of cages for chickens. Our investigations have time and time again revealed the extreme suffering of hens locked in crowded wire mesh cages that deny them all of their natural behaviours, and the heartache of mother pigs imprisoned in barren metal crates that prevent them from nurturing their newborn piglets. 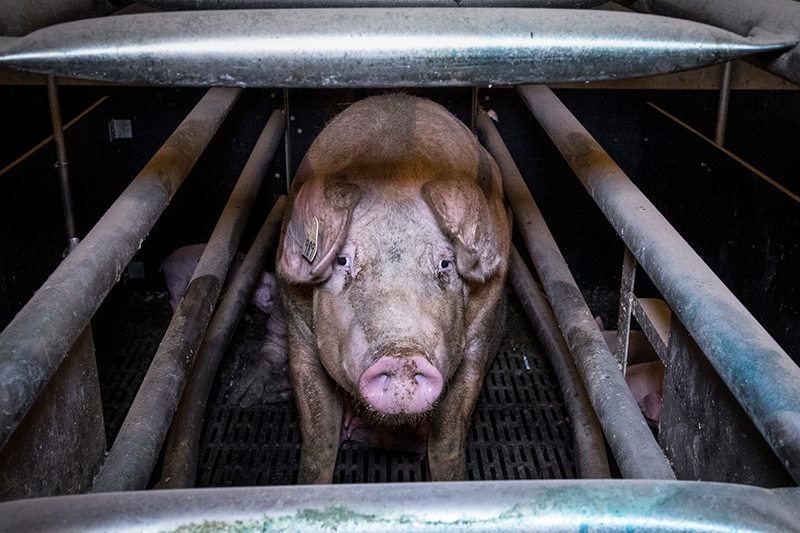 It is obvious to any compassionate person that this unnatural confinement causes physical and mental anguish. Over 300,000 female pigs used for breeding are still caged for 6 weeks every time they give birth in the UK. The government’s response is simply not good enough, which is why it’s even more important we gather as many signatures on the End the Cage Age petition as possible and keep the pressure on them to ban all cages for good. If you haven’t yet added your name to the petition, please do so here. If you’ve already signed it, please share the link widely with your friends and family. The sooner we reach 100,000 signatures, the stronger our voice is for the animals. Running a Marathon for Animal Equality! Animal Equality demands Duck and Waffle drops cruel foie gras! Animal Equality calls for a #FoieGrasFreeGB with Day of Action!